Good morning! Quick post for today as I really need to finish packing and get things ready for our trip to CA. Sabrina has been watching Charlie Brown Christmas non-stop (it's one of my favorites, too! ), so I thought I'd make a card with the Peanuts gang. I used Mercy's latest sketch, MTSC52 and used traditional Christmas colors of red and green for Sparkle's Christmas Card Challenge #2. I'm sorry the lighting is all wonky - I took the photo quickly and not with my normal camera as that is packed and ready to go! Accessories: Petite Oval Nestabilities (Spellbinders), Holly Ribbons embossing folder (Provo Craft), Markers (Copic), Snowflake punch (Martha Stewart), Foam tape. Awww, Charlie Brown and the gang..how perfect for the holidays! 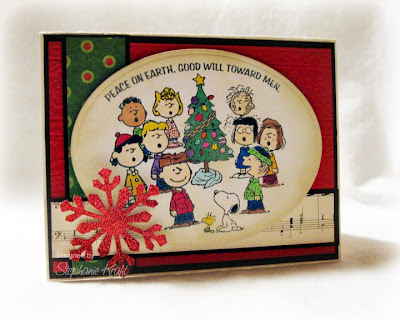 This is a very cute Charlie Brown Christmas card! I love snoopy. this is so cute, stephanie...i love me some snoopy and peanuts characters! great papers, embossing, coloring, and snowflake accent! This is so much fun! I'm a huge Charlie Brown fan.